BOSTON, Massachusetts, April 13, 2011 (ENS) – Investor organizations holding over $170 billion in assets are urging the U.S. Environmental Protection Agency to evaluate the mine waste impacts of the proposed Pebble Mine on Alaska’s Bristol Bay watershed, an ecosystem of international significance. The stakes are high. 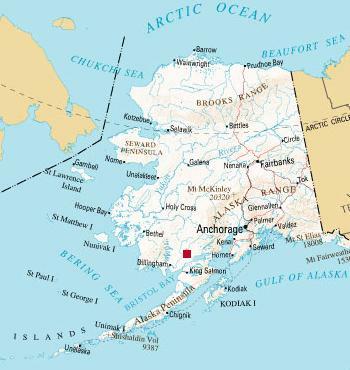 Southwest Alaska’s Pebble mine site holds the world’s largest undeveloped copper-gold-molybdenum deposit, while Bristol Bay supports the world’s largest remaining wild sockeye salmon runs, which produce roughly half of all the world’s commercial sockeye salmon. Led by Trillium Asset Management Corp. and Calvert Investments, the 29 investor organizations hold over 13 million shares in Anglo American plc, the UK-based mining company behind the proposed copper, gold and molybdenum mine. They are asking the EPA to initiate a review process under the Clean Water Act. Opposition to the proposed mine is building ahead of Anglo American’s annual general meeting in London on April 21. “Ecosystem degradation is of serious concern to investors,” said Stu Dalheim, director of shareholder advocacy at Calvert. Pebble Mine is proposed for the headwaters of the Bristol Bay Fishery Reserve by Anglo-American and Northern Dynasty Minerals Ltd. of Canada. Under current plans, the project would create the largest open pit mine in North America, enormous toxic tailing ponds and a significant infrastructure footprint to extract an estimated $150 to $200 billion worth of minerals. The proposed pit would be about two miles wide, and several thousand feet deep. The mine would require two tailings storage lakes engulfing two valleys. Four earthen dams are proposed to contain the tailings – the largest would be 740 feet tall and 4.3 miles long, larger than China’s Three Gorges Dam. The mine site is located 14 miles from Lake Clark, and near the Lake Clark earthquake fault. A peer-reviewed 2010 risk assessment of the mine by The Nature Conservancy concluded that the risks to wild salmon populations are “very high,” and that it is cause for significant concern regarding the long-term abundance and sustainability of salmon in the region. In response to petitions by Bristol Bay native tribes and corporations, commercial fishermen, businesses, and environmentalists, the EPA announced in February that the agency will conduct a scientific assessment of the Bristol Bay watershed to evaluate the suitability of large-scale mining development there. Some observers see the assessment as a precursor to a full EPA 404(c) review. Anglo American chief executive Cynthia Carroll has promised to back out of the Pebble Mine project if communities opposed it. “I will not go where people don’t want us. I just won’t. We’ve got enough on our plate without having communities against us,” she told “Fast Company” magazine. 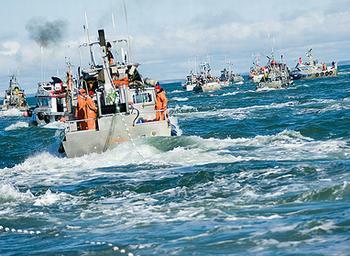 Responding to public opinion surveys, 80 percent of Bristol Bay residents said they oppose the mine. In a statement earlier this month, Northern Dynasty President and chief executive Ronald Thiessen said that our “appetite for mineral resources is growing,” to feed our use of electronic devices and the electric wiring to power them. He reasons that if his company cannot meet the market demand, others will, and points to the jobs mining will bring to local communities. But selling metals from the Pebble Mine will not be easy. At least 58 jewelers, including Tiffany & Co., Zales, and Boucheron have signed the Bristol Bay Protection Pledge, stating that they will not use gold from the proposed Pebble Mine should it ever be developed. To emphasize public opposition to the Pebble Mine, at the end of March, a week-long Save Bristol Bay campaign brought salmon and environmental advocates to Washington, DC. To kick off the week, more than 200 chefs and restaurateurs, including Tom Colicchio, Alice Waters and Mark Bittman, sent a letter to EPA Administrator Lisa Jackson, urging her to invoke Section 404(c) of the Clean Water Act and protect Bristol Bay. 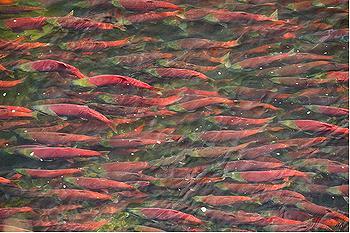 Some 20 DC restaurants featured Bristol Bay salmon on their menus. Advocates explained that the Pebble Mine would destroy 12,000 commercial fishing and fish processing jobs in exchange for about 2,000 short-term mining jobs, to extract minerals that would be exported to China and India. The mine also would harm British salmon consumers. The UK is the world’s largest importer of canned Bristol Bay salmon, importing 10,000 metric tons a year, worth on average over 30 million pounds. 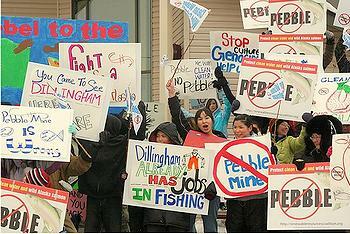 Opposition to the Pebble Mine spans both political parties. Rick Halford, an Alaska Republican politician, sportsman, guide and pilot traveled to Washington to lobby against the mine. A former Alaska State Senate president who served for 24 years in the state legislature, Halford told reporters that Pebble Mine would extract the metals from low-grade ore, generating mountains of waste. Halford warned that the planned 100 mile transport route from the mine to Bristol Bay lies across mountains and along the shoreline of the region’s largest lake. 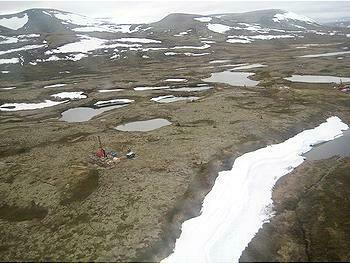 “Even the exploration is dangerous,” said Halford, explaining that at least 1,200 exploratory holes already have been drilled, but they are not cased, and not plugged all the way down.